Don't miss the opportunity to see the Grammy award-winning Okee Dokee Brothers in conert and meet them after the show! Tickets are $10 (3 years+) and are available at the 37th Street HyVee Customer Service counter, online, or at the door. Join SEMSA and guest clinician Drew Robertson for an improvisation workshop on January 15-16, 2016 in Rochester, MN! Suzuki students of all instruments will have the opportunity to work with Drew Robertson in 30-60 minute session on both of the workshop days and will participate in a wrap-up jam session on Saturday, January 16, 2016 at 7 PM. Students will be divided by book level with final class times to be determined according to the number participating. The fee for participation is $20; and the registration deadline is December 18, 2015. Parents should remit the payment and registration forms to their studio teacher or at the Friday, December 18 group lesson. Alternatively, they may send payment to Judy Hickey, 1807 Northern Viola Ln NE, Rochester, MN 55906. All events will be held at the new SEMSA group lesson location - Rochester Covenant Church in Rochester, MN. Improvisation is a great way to build confidence in instrumental playing, sensitivity to harmony, rhythm and progressions. Please make sure to join us for this unique workshop. You can download and complete the registration form. SEMSA is excited to provide an Improvisational Workshop in 2016. The workshop information will be posted on this page as it becomes available. For now, we ask that you reserve these dates so student musicians can attend this exciting event. 5 months ago ago by SEMSA Suzuki. Nine students performed on SEMSA's first honors recital of the 2015-2016. 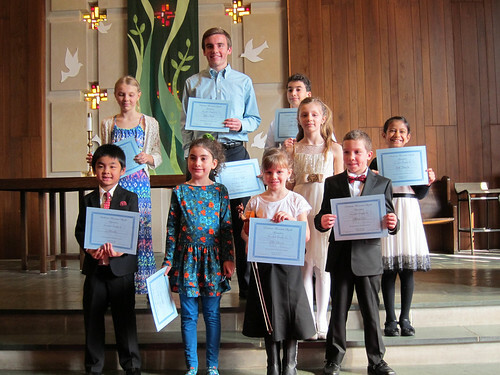 Congratulations to all of our well-prepared musicians! Thanks for sharing your music.